"Perfect for Sunday dinner or Easter feast. No one leaves ham on their plates or room for more with this easy glaze. I've caught my wife eating just the drippings it is so good." Place the brown sugar, molasses, mustard, bourbon, ginger, cinnamon, cloves, and black pepper in a mixing bowl and stir until the sugar has dissolved. A versatile, super tasty, sweet and sour condiment. 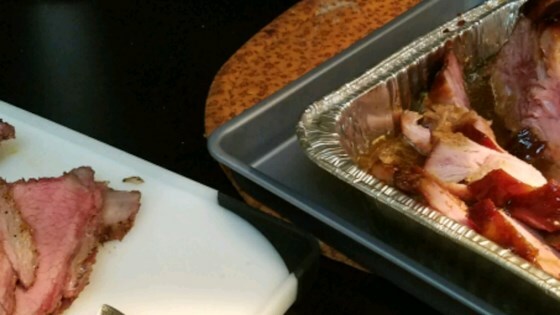 To use, spread glaze over a ham that has been scored with a sharp knife in a diamond pattern. Cover and bake for 3 hours in an oven preheated to 250 degree F. Increase the oven temperature to 350 degree F and baste with more glaze. Bake uncovered for 1 hour. Any remaining glaze can be heated and used as dipping sauce or gravy. We made this glaze for Easter dinner and it was a hit. My mom loved it. We used a precooked ham and didn't use the bourbon and cooked for like an hours and a half. Was so good. Excellent didn't change a thing!! I used this glaze on my Easter ham. Everyone who tasted it wanted the recipe. I can't wait to try it on a pork loin!